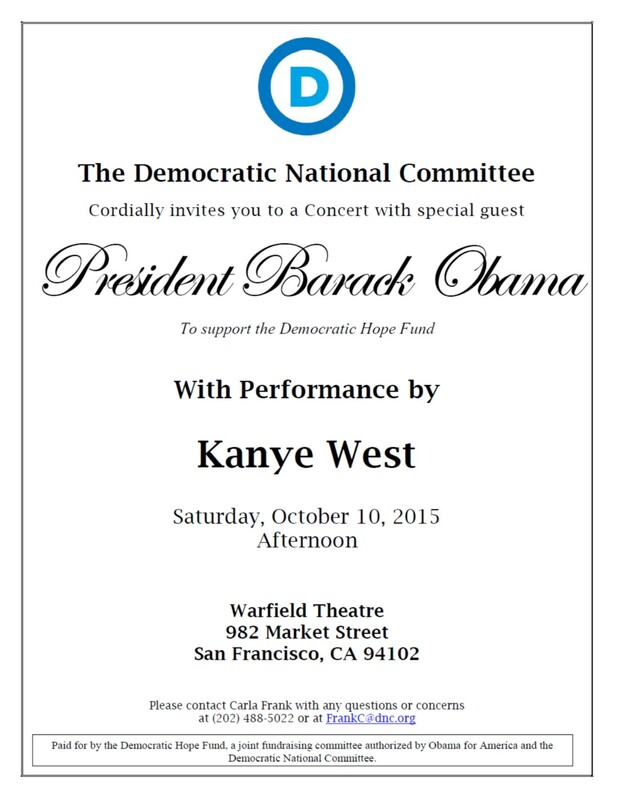 Please come out and support the Democratic National Committee’s Democratic Hope Fund at this afternoon concert featuring special guest, President Barack Obama, and musical performance by Kanye West and Saturday, October 10, 2015 at the Warfield Theater (982 Market Street) in San Francisco. Prices for attendance: $250 General Admission; $1000 Premium Seating; $5000 Photo with President Barack Obama (each additional person $1000/individual) and; $10,000 for VIP Reception with President Barack Obama. Please visit http://bit.ly/1NZItRW to purchase your tickets. Many thanks.